Paul Fichtenbaum, Editor for Time Inc. Sports Group; Lonnie Ali, wife of Muhammad Ali; Will Smith; and Jack Nicklaus, recipient of the Muhammad Ali Legacy Award. Time Inc.’s Sports Illustrated honored Jack Nicklaus as the first recipient of the Muhammad Ali Legacy Award at a special event in New York City on December 15. The award was created in 2008 to honor athletes and sports figures that have embodied the ideals of sportsmanship, leadership and philanthropy as vehicles for changing the world over their lifetime. Earlier this year the award was renamed the Sports Illustrated Muhammad Ali Legacy Award in tribute to the iconic boxer and humanitarian. The evening also celebrated Sportsperson of the Year, tennis star Serena Williams. A 21-time Grand Slam winner, Williams lost just three of 53 matches in 2015, and with her loss in the US Open semifinal, came one shy in her quest to win all four Grand Slam titles in the same year. The evening’s two other winners were Hunter Gandee, Sports Illustrated‘s 2015 High School Athlete of the Year and Reece Whitley, Sportskid of the Year. 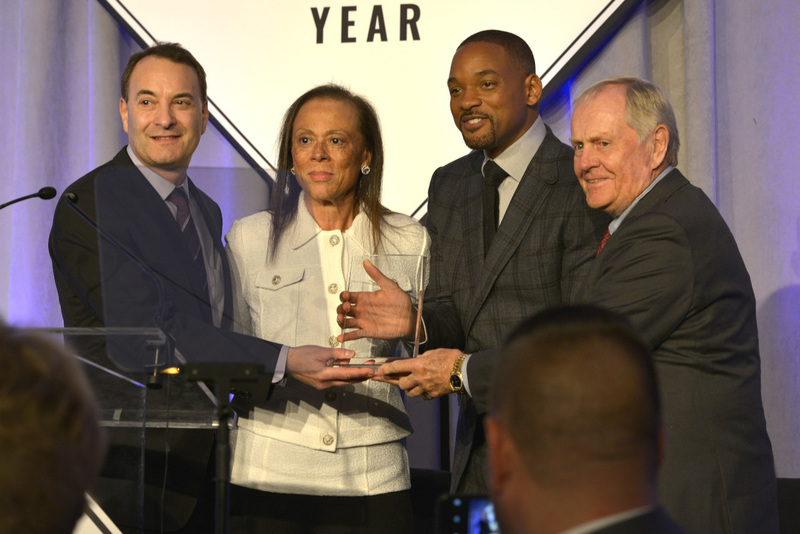 Actor Will Smith, Lonnie Ali (wife of Muhammad Ali), Venus Williams, and NFL legends Boomer Esiason and Eddie George were present to recognize the evening’s honorees. Before a room overflowing with a “who’s who” of sports and entertainment, Jack provided the “why” behind his ever-growing legacy in the golf and sports worlds. “It is perfectly fitting that Lonnie represent Muhammad and the Ali family to present this award,” the Golden Bear explained. “Because I know Muhammad would agree with me, that if it wasn’t for our wives and our families, we would have never been the athletes, the champions, and the people we are today. Several tables Tuesday night were populated with many of Jack and Barbara’s five kids and 22 grandchildren—the latter number staggering Lonnie Ali almost as much as the Golden Bear’s unparalleled record in the game. “For decades, Jack set the standard for his sport in golf. His life in sports is one long list of outstanding achievements, awards, and accolades—in fact, the list is so long, that my finger got tired of scrolling down the list on my computer to read them all,” joked Lonnie Ali, Muhammad Ali’s wife of 29 years. Lonnie Ali presented the award on behalf of Muhammad, who shared his sentiments prior to Tuesday’s ceremony. Nicklaus, who this year became just the seventh athlete in history to be awarded the Congressional Gold Medal, received the award for a lifetime of success and influence as one of the greatest golfers of all time. He is a record-setting champion of the sport who has also made philanthropy a central part of his legacy. He joins Eunice Kennedy Shriver, founder and driving force behind the Special Olympics, and Earvin Magic Johnson, renowned entrepreneur, philanthropist and social and political activist, as Legacy Award honorees. But the Golden Bear is the first to be honored with the award bearing Ali’s iconic name. Jack made a point to mention that at his home in North Palm Beach, Fla., on walls covered in family photos, there hangs aspecial photo—one of Ali and him playfully sparring at the PGA Championship in 1996 in Ali’s hometown of Louisville. After accepting their honors, Nicklaus and Williams joined Q&A moderator Boomer Esiason on the stage, delighting the crowd of 400. Nicklaus’ competitive career spanned five decades and includes 120 professional tournament victories worldwide and a record 18 professional major-championship titles (six Masters, five PGA Championships, four U.S. Opens, three British Opens), as well as being a five-time winner of the PGA Player of the Year Award. He has won recognition and praise for his dedication to excellence and his stewardship of the game, from personally designing close to 300 courses worldwide to his leadership in restoring golf to the 2016 Olympic Games. Nicklaus, known as the “Golden Bear,” has used his platform over the decades to support myriad charities, most of which have focused on pediatric health care. He and his wife, Barbara, created the Nicklaus Children’s Health Care Foundation, which provides pediatric services in various communities nationwide. It has raised tens of millions of dollars over the last decade, and reached a significant milestone this year when Miami Children’s Health System renamed its flagship hospital, as well as eight outpatient centers, Nicklaus Children’s Hospital. He also supports a number of other pediatric care organizations, including Children’s Miracle Network Hospitals and St. Jude Children’s Research Hospital. As co-chairman of the Nicklaus Companies, he has integrated give-back components benefiting these and other children’s charities in a number of products—from golf balls to wine to ice cream. In addition to being recognized by almost every major publication in the world as the greatest golfer of the last century, other accolades and awards for Nicklaus over his lifetime include being only the 17th person in history to receive the Presidential Medal of Freedom and the Congressional Gold Medal (the highest honors given to any U.S. civilian). Nicklaus and Ali were awarded the Presidential Medal of Freedom on the same day in 2005 by then President George W. Bush. The Golden Bear has also been honored with the PGA Tour Lifetime Achievement Award; the Woodrow Wilson Award for Corporate Citizenship; and has been inducted, along with his wife, into the Ambassador David M. Walter International Pediatric Hall of Fame.